John Sampson leads the Regional Partnership’s mission to generate business investment in the region. 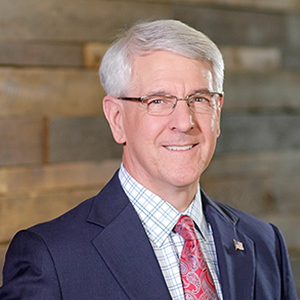 As president and CEO of the Partnership, John actively supports collaborative relations with stakeholders, promotes regional communications, and works to expand all channels of business development on behalf of the 11 local economic development organizations in Northeast Indiana. Previously, John served as the vice president for external affairs for American Electric Power, representing Indiana and Michigan with responsibility for public policy advocacy and proactive interaction with external stakeholders, including legislators, regulators, government officials, customers, and business and community leaders. Prior to his work in Indiana, John served as site vice president and plant manager of the Donald C. Cook Nuclear Plant, in Bridgman, Michigan. During that time, he was elected vice president for Indiana Michigan Power, a wholly owned subsidiary of AEP. John joined AEP in 1985, and during his tenure with AEP, served as the operations production supervisor, safety and assessment superintendent, operations superintendent, and assistant plant manager for technical support. Prior to his service with AEP, John was the maintenance production manager at the Washington Nuclear Project No. 2, operated by the Washington Public Power Supply System. A graduate of the U.S. Naval Academy, John holds a bachelor of science degree in aerospace engineering and was licensed as a senior reactor operator for the Washington Nuclear Project and the Cook Nuclear Plant. During his naval service, John qualified as an engineer in the Naval Reactors program. He completed the AEP management development program at Ohio State University and the Senior Nuclear Plant Management course at the Institute of Nuclear Power Operations. John is blessed to be husband to Pamela, dad to Rachel and Michael and father-in-law to Amanda. While not an Indiana native, John is grateful to call Fort Wayne his home and to be a Hoosier by choice!